This roasted eggplant and pomegranate dip is absolutely delicious. It has a refreshing summer flavour. Recently I have been doing a lot of my shopping at one my local Turkish shops were they sell beautiful items like fresh feta, big bunches of fresh mint, pomegranates and lots of different spices. I got inspired to cook more Middle Eastern-style food by Ottolenghi’s amazing cookbook Plenty. I love everything eggplant, but he even dedicated a whole section of his cook book to the “The Might Eggplant”. I love eggplants most when roasted or grilled. That lovely soft, buttery texture and that beautiful smoky, sweet flavour. This recipe is inspired by some of the dishes in Ottolenghi’s cookbook. I used two ingredients I have never tried before: pomegranate molasses and a Middle Eastern-style spice blend called za’tar with wild thyme, oregano, cumin, sesame seeds and sumac. 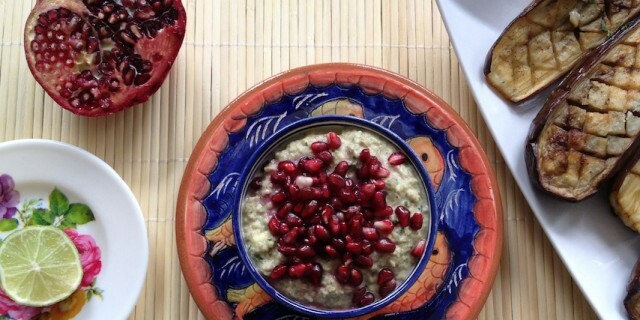 I love the combination of flavours in this Roasted eggplant pomegranate dip. It’s great with a simple green salad and some fresh home-made bread. Rinse and dry the eggplant. Cut off the ends and discard them. Cut the eggplant in half lengthwise. Use a sharp knife to cut a diamond-shaped patterns. Make sure you don’t cut through the skin. Place the egg plants open-side up in a large baking tray. Pour olive oil onto them and use your hands to rub the oil into the skin. Repeat until the skin has absorbed the oil completely. Sprinkle with fresh thyme, sea salt and pepper. Roast in the oven for 40 minutes or until the flesh is soft and beautifully browned. Allow to cool down. Spoon out the flesh of the cooled down roasted egg plants. Add the egg plant flesh to a medium-sized bowl. Add all ingredients except for the pomegranate seeds and mix well. Season with sea salt and freshly ground black pepper to taste. I used hand-held blender to quickly pulse the mixture so it becomes less chunky. Use a spoon to mix two thirds of the pomegranates seeds in and then serve with the rest of the pomegranate seeds and some fresh leaves of mint on top. Sprinkle with some extra virgin olive oil on top and enjoy!